I collect Georgian silver but, lacking the space for vitrines I display my hollowware on open shelves where they rapidly tarnish. I had either to stop collecting hollowware, accept disfigurement, commit to continued laborious and possibly deleterious cleaning, or find reliable tarnish protection. I decided on tarnish protection. I thought it would be easy; it wasn’t. I started with the most respected silver repair shop in Seattle where I live. They would, for an undisclosed price, clean and coat pieces with an undisclosed coating. I would have to leave items with them, receive an estimate, and trust their work. The option would involve an hour plus round trip drop off and pick up each time for uncertain and costly results, possibly equal to what I’d paid for the pieces, for work I thought I could do myself. I could find no texts for guidance. I searched the web, asked manufacturers, dealers, and other collectors, with mixed results. Some manufacturers were helpful, others secretive or uncommunicative. I was surprised by the sparse, too often conflicting, information. I identified the V & A and UK Conservation Register online articles, which I append, as being most useful. They contain basic, and possibly serious, disagreements such as the use of Silver-Dip. The UK Conservation Register recommends it, whereas V&A does and does not. Not only conflicting, but incomplete. I have spoken and corresponded with conservators at major institutions for help. Conservators are cautious: they work with valuable, often irreplaceable objects and are trained to avoid damage. A responsible conservator is careful in providing opinions. Their standards are perforce higher than most private collectors. They are aware they might be misunderstood, misspeak, or mislead, and might be liable to legal issues. I therefore maintain my sources anonymity. I offer the following procedures based upon my research and practice. The best I can say is, it suits my purposes. While there are many silver cleaners on the market, the V & A uses Goddard’s Long Shine Silver Foam, available in two sizes direct from the manufacturer. It removes tarnish effectively without apparent damage albeit sometimes with considerable effort. Where the tarnish is especially stubborn I use a small felt buffing wheel in a hand held Dremel tool operating at minimal speed, moving the disc to avoid swirl marks. I cautiously use red or white rouge if I wish to buff out unsightly areas, but take care not to obliterate patina. I have used a stainless steel dental scraper to remove stubbornly embedded dirt. Cleaning can be a tedious process especially if the piece is heavily tarnished. I use differing lights but stain can be very difficult to detect on the reflective surface. After cleaning I wash the silver repeatedly with warm tap water either with a mild soap or non phosphate detergent, wiping it with a soft cotton cloth to ensure no trapped Foam remains. The V&A uses deionized water but I have decided not to be that scrupulous. Some conservators recommend Goddard’s Silver Dip, a blue liquid that miraculously removes tarnish without effort. It contains thiourea which I long ago used to clean daguerreotypes. Well and good, except that most recently the V & A website advises never to use it or any other chemical cleaner. They state Silver-Dip can leave a white surface, remove the patina, and make the surface hyper-active accelerating future tarnish, which I believe was my experience using it. I have tried Hagerty’s silver polishing cloth, another product recommended by experts. I found it was not effective in preventing tarnish. The UK Conservation Register cautions against using it for antique silver and I no longer use it. I wear white cotton gloves to handle silver except when I’m washing it. I figure the soapy water will remove oils on my hands. 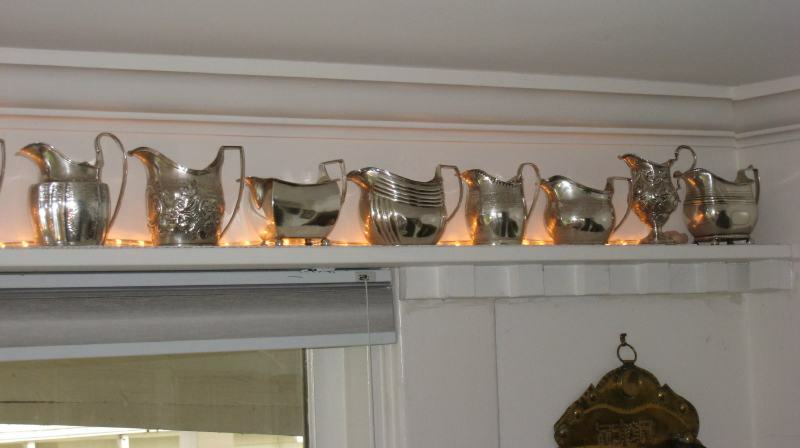 Detail of the Georgian cream jug shelf. One institution employs alkyd paint for applying acquisition numbers. I use black Winsor Newton Griffin Alkyd paint with a 0 or finer hair brush. At first I used a thin layer of paint but have found a more substantial layer reads and lasts better. Despite having lettered professionally I find painting on a reflective, often curved, surface difficult and the results usually not satisfactory. Solvents, such as acetone, will remove alkyds from silver. Another museum practice is the use of a permanent archival pen directly on the silver or on a removable dot of acrylic paint. I have not used this and suspect coating solvents might dissolve it. A more recent alternative I intend to adopt is to computer print the identification using thin acid-free paper. Paint a dab of acryloid on the piece, adhere the number on it, and top coat it with another dab of acryloid, or when you coat the piece. 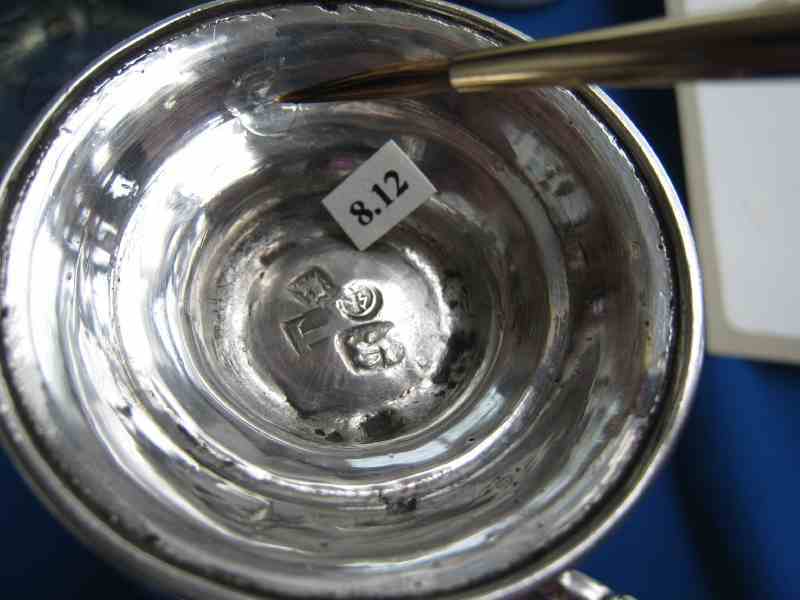 Coating silver is controversial; some institutions do it, others are shocked. But institutions have sealed cases; I don’t. There are complaints about lacquer peeling, ugly discoloration, opacity, loss of reflectivity, a "plastic" appearance. I suspect using the wrong coatings, such as irreversible varnish that cure by polymerization rather than evaporation, may cause the difficulties (note 1). The V & A uses three coats of Frigilene, a cellulose nitrate-based lacquer. I purchased Frigilene and brushed it on only to find the tarnish rapidly returned. On investigation I learned I had been sold a spray concentration, too dilute to effectively brush on. No identification on the can. I didn’t think to try using an airbrush which should provide more assured coverage than a brush. Perhaps I will in future. In the literature I discovered conservators employ acryloid coatings for metal conservation. I have used Liquitex’s Gloss Soluvar picture varnish for many years with excellent result; museums employ it as well but not, as far as I know, for silver. I have been unable to determine which acryloid Liquitex (note 2) uses but am satisfied it is sufficient for my purposes. It is crystal clear, soluble in turpentine, and completely reversible: it thins and washes off with turpentine. Do not use mineral spirits. I use a soft fine hair non shedding brush which I keep only for that use, cleaning it in its own container of gum turpentine. Complete coverage is important; "holidays" will allow tarnish. I use quick, leveling, overlapping strokes. Soluvar is crystal clear; it is difficult to monitor coverage. It sets up rapidly; don’t dawdle. Examine carefully for drips and thicknesses which you can smooth out within the first minutes. If you botch, you can try re-dissolving it with your brush, or wash the acryloid off with turpentine and start over. Should you not be familiar with brushing on coatings I suggest you practice on a piece of scrap metal. Turpentine is toxic; use it in a well ventilated space. Don’t let the fumes accumulate. I try to do my coating outdoors in a protected area. I do not wash the brush in water afterwards as I would a paint brush. Soluvar is very resistant to water. Even after a thorough turpentine rinse the bristles may dry stiff. Not to worry; they will quickly soften in Soluvar. Winsor Newton (note 3) has an aerosol picture varnish, and a brushable varnish; the composition is proprietary. I do not know its suitability for protecting silver. There may be other aerosol picture varnishes on the market, but I am unaware of them. Twenty years ago we had a brass samovar lacquered and it remains pristine. The manufacturer sells an aerosol product for silver but I’m not satisfied it is as safe a long term choice as Soluvar. Since Soluvar is readily available and easy to use I see no reason to look further. According to Ed Munves of James Robinson in New York City, using your silver is the best thing you can do for it. Frequent use means frequent cleaning, and hot, soapy water helps combat tarnish, which is caused by sulfur in the air. Every piece of silver at James Robinson is stored in a heavy airtight plastic bag, which protects the silver and enables you to identify each piece. For large objects such as trays, use dry-cleaning bags. Enclose your piece in two or three layers of bags for added protection. Squeeze the air out of the bags, and use a wire twist to close them. Never use a rubber band to seal silver. Tarnish-resistant cloth also prevents tarnish. Kenized cloth, flannel treated with zinc nitrate, is one option. It remains effective indefinitely, but can't be washed. Pacific cloth is the best cloth for preventing tarnish: it contains silver particles, which help keep silver from tarnishing. Still, Ed maintains that plastic bags are better than cloth, because cloth bags tend to get dirty over time, especially when they sit around the kitchen. Although plastic wrap is a viable alternative, it's a nuisance to use and remove. Plus, if any moisture gets trapped inside the wrap, cleaning the silver can be difficult. If you're not planning to use a piece for an extended period of time, you can wrap it in tarnish-resistant cloth and then seal it in an airtight plastic bag. Martha lines a large, flat drawer with tarnish-resistant cloth, fastened together with grosgrain ties. If you line a drawer with tarnish-resistant cloth, don't glue the cloth to the drawer because glue has sulfur in it, which can tarnish the silver. There is another type of coating for silver, called, at least in this country, 'Monarch Shielding' we have never used it and I have never met a conservator who has, but it is supposedly a type of lacquer that is applied and then baked in an oven to harden it. We have had the odd object come to our studio which we suspect has been treated with this lacquer, the only thing that touches it is paint stripper. However, like Frigilene, if it not applied correctly you will get black tarnish on the bare spots. I don't know where to get the Monarch Shielding, if that is a coating you wish to try, but I expect a web search will provide a supplier. Soluvar seems safe to use on silver. It apparently blocks the air exchange needed for the tarnishing process. I guess the unknown is - for how long. Testing on his part will answer that question - in time. Unfortunately, we are unable to share the acryloid information about Soluvar, for as I suspected, the information is proprietary. Because all of our varnishes are designed and tested for a fine art usage - mostly applied on oil, acrylic alkyd paintings - we unfortunately cannot offer any guarantees/advice on how the varnishes will behave as a protective coating for antique silver. I will attempt to find out for you any information I can regarding an acryloid designation for the varnishes. In the meantime, if you visit our website at www.winsornewton.com , you can look up the Manufacturers Safety Data Sheets (MSDSs) for each varnish product, which will provide you with some information on contents. These MSDSs can be found by clicking through the Resource Centre link, to the Health and Safety Data Sheets section. We have recently started using 'Corrosion Intercept' bags to store some of our unlacquered silver. There are opaque however so not really suitable if you want to look at your silver, however for storage they are useful, once the copper in the polythene film runs out and is no longer protective the bag turns black so you know when to replace it. The manufactureres claim about 10 years useful life, however we have only been using them for about two, so it is too early for us the say if that is correct. 11/22/ 07 I attach the leaflet for silver cleaning which we use for enquiries such as yours. - Clean silver as soon as possible after use. Garlic left overnight on a silver spoon or fork will turn it black. Some other foods to watch out for are fruit juices, eggs, salt and onions. 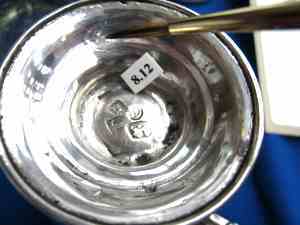 - Often warm, soapy water is enough to remove light silver tarnish. Dry thoroughly using kitchen towel. - When handling silver try to use clean cotton or nitrile gloves and replace it in its storage bag when not in use or on display. If handling with bare hands is unavoidable before replacing in storage wipe the silver over with a paper towel and acetone. Acetone can be bought from most chemists. This will remove any oils from fingerprints left on the silver. - When silver does look tarnished use a silver cloth to clean. These can be bought in most large supermarkets. Avoid the use of cream or powder cleaners as they can build up in crevices and spoil the design. Sometimes however you may need to use these, in which case remember that less is more. - Steer clear of chemical treatments such as ‘Silver Dip’ or the ‘miracle’ silver cleaners which usually involve aluminium plates or foil and baking soda in hot water as the chemicals are difficult to remove and can leave a matt, very white surface finish. Soluvar seems safe to use on silver. It apparently blocks the air exchange needed for the tarnishing process. I guess the unknown is - for how long. Testing on his part will answer that question - in time. Unfortunately, we are unable to share the acryloid information about Soluvar, for as I suspected, the information is proprietary. We've also sent your questions to the chemists in the UK for any additional information. As before, I'll share any additional news with you as I receive it. Thank you for your inquiry regarding varnishing silver objects. Because all of our varnishes are designed and tested for a fine art usage - mostly applied on oil, acrylic alkyd paintings - we unfortunately cannot offer any guarantees/advice on how the varnishes will behave as a protective coating for antique silver. I will attempt to find out for you any information I can regarding an acryloid designation for the varnishes. In the meantime, if you visit our website at www.winsornewton.com , you can look up the Manufacturers Safety Data Sheets (MSDSs) for each varnish product, which will provide you with some information on contents. These MSDSs can be found by clicking through the Resource Centre link, to the Health and Safety Data Sheets section.